Welcome to Asobi Teppanyaki! The word “asobi” means “to have fun” or “to play” in Japanese. We chose the name to help promote an enjoyable atmosphere! 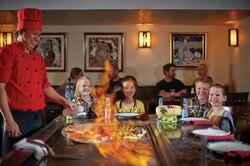 Please also visit our original Teppanyaki restaurant in Vail! We also own Vail's longest standing Chinese Restaurant!